MythWeather is a plugin that downloads and displays weather information. For those users who are compiling their copy of MythTV and the plugins, there are a few dependencies to worry about. The plugin itself does not depend on any external libraries (other than those common to all MythTV plugins). However, MythWeather uses external grabber script files that actually download the weather data it displays. These grabbers live in the <prefix>/share/mythtv/mythweather/scripts directory by default. If you would like to test for the required modules before trying to install MythWeather, below is a quick way to do so. This is the same method used by the ./configure script. If the command runs successfully with no output, all necessary modules are installed. If you need help installing PERL modules, check out the FAQ over at CPAN. To compile MythWeather from source, grab a copy of the source code from the MythTV downloads page or check out a fresh copy of the plugins from SVN. If you're compiling the plugin yourself, I assume you are somewhat familiar with the process and won't explain the gory details of how to get your source tree set up. For those, check out the HOWTO, specifically the Plugins chapter. This will build the MythWeather plugin and install it using the default prefix (usually /usr/local). If you have your mythfrontend configured to run as root, whenever it executes a PERL script (i.e. to update the weather information), PERL will run in Taint Mode. This causes problems for the grabber scripts, because Taint Mode removes '.' (the current directory) from the @INC array in PERL. For more info, see #4954. This should get your grabbers working again. All configuration of MythWeather is done through the frontend. For global configuration of the plugin, go to the Utilities/Setup→Setup→Info Center Settings→Weather Settings page. If this is enabled, mythfrontend will automatically download new weather data in the background. This improves the startup time of MythWeather drastically, since it no longer will wait for the initial data retrieval. The grabber scripts run with nice, so you shouldn't notice anything while watching TV. As the page itself indicates, this feature isn't done yet. However, when it is, the plugin will not display pages that have no data. List of Inactive Screens. You can add these to the Active Screens by selecting them. List of Active Screens. You can modify their properties by selecting them. List of actions you can perform on this Active Screen. Search results when changing the location. Change the type of units used to display the weather information. The page allows you to choose from a list of Inactive Screens. By selecting one of these items in the list, it will be copied into the Active Screens list. This screen displays the most recent observations of weather. Displays a weather forecast of conditions and temperature for the next eighteen hours. Displays a weather forecast of conditions and temperature for the next three days. Displays a weather forecast of conditions and temperature for the next six days. Displays a static map image for the configured location. Displays text warnings about severe weather in the configured location. Once in the Active Screens list, you can modify the properties of the screen by selecting it. Some screens have more actions than others, depending on what they do. For example, the Animated Maps screen doesn't use Units, so you don't have an option to change them. Allows you to change the location for the selected screen. Selecting this action will prompt you to search for a new location. You can enter text into the search field with your keyboard, or using the pop-up keyboard and your remote control. Searching can usually be done with regular expressions as well. Allows you to toggle between SI and English units. (SI is metric, English is... well, English). Moves the selected screen up one position in the Active Screens list. Moves the selected screen down one position in the Active Screens list. Deletes the selected screen from the Active Screens list. Returns you to Screen Setup. Don't forget to click on the Finish button on the Screen Setup page when you're done! This will save all of your screen definitions and return you to the main Weather Settings page. 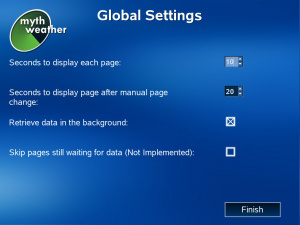 This screen allows you to customize the settings for each weather source you have defined. The Source Setup screen will only display the sources that you are using for your configured Active Screens. 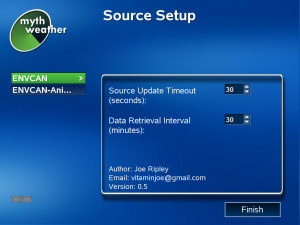 The Source Setup screen is also nice enough to provide you the credits of who wrote your configured weather source grabber and it's current version. Note: Some grabbers will locally cache their downloaded data to limit the effect on the servers they use as a source. Once configured, using MythWeather requires little brain-power. When the plugin is started it will begin cycling through the screens. If you wish to pause on a screen press PAUSE (p). If you wish to manually move between pages, use the left and right arrows. If you wish to manually initiate an update, press 'u'. Thats about it, to exit press EXIT (escape). Sources are external programs which retrieve weather data. They can be found in the scripts/ directory of the MythWeather source tree, when installed they are in <prefix>/share/mythtv/mythweather/scripts/ where prefix is usually /usr. If you are interested in how the sources interact with the plugin there is a README in the scripts/ directory. Below is a list of sources currently included with MythWeather. If you write a source feel free to provide a link to it here. These sources cover the globe. If you can't find a local provider of weather data, use these instead. These two scripts provide forecast data for Current Conditions and Three Day Forecasts for almost any major city in the world. More detailed information is available for UK cities and towns. Accu weather has for almost any major city in the world detailed weather forecast. This script reads the accuweather forecast data for Current Conditions and Three and Six Day Forecasts. These sources are all for locations in the United States. This scripts retrieves severe weather alerts from the National Weather Service. Locations are codes retrieved from bp16mr06.dbx. For an explanation of this file see http://www.nws.noaa.gov/geodata/catalog/wsom/html/cntyzone.htm. It uses this same file to do its location searches, simply checking if each line matches the search string passed to it. This script downloads and static and animated maps from weather.com. weathercommaps.pl was used to crawl weather.com's map room and generate the maps.xml file, which is then used for the static map source (maps.pl) and the animated map source (animaps.pl). Location searches look at the map name, so you'll probably want to search for things like "radar", "doppler", "northeast", etc... Maps from other sites can be added easily, just follow the format in maps.xml. These sources are for locations in Canada. This script downloads XML RSS feeds from Environment Canada's Weather Office site. Location searches are powered by the ENVCAN-Stations.xml file, which contains a list of all defined Canadian sites. When searching, simply look for the city or town that you're closest to. This script downloads animated map images from Environment Canada's Satellite Imagery service. The locations are all named after the regions the images cover. So, search for stuff like 'Western' or 'Eastern' to get the best results. If in doubt, take a look at the ENVCAN-Maps.xml file... it defines all of the animated maps. You can use the weather.com settings or BOM for Australia. weather.com is the default. It works for a three day listing but I cannot get the animated maps working yet. The link above has not been accessible for some time now. If there is a problem with this page, feel free to fix it. Questions about using MythWeather should be directed to the mythtv-users mailing list or #mythtv-users on freenode. Issues or bugs with the code should be directed to the mythtv-dev mailing list or #mythtv channel.